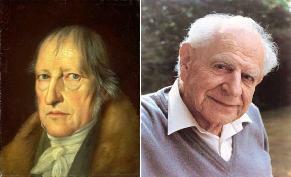 Hegel or Popper? Dialectic or falsifiability? Pick your formulation for theory revision. In Today’s Thought on Civilization I proposed a principle for the historical viability of civilizations (“A civilization fails when it fails to change when the world changes”), and in More on Republican Disarray I formulated a schema from this principle that was at once more general and generally applicable to particular circumstances (“An x fails when it fails to change when the world changes”) and then applied it to the current woes of the Republican Party. A philosophical principle always marks both a beginning and an ending. To arrive at a principle is already to have performed a significant act of abstraction that allows one to cut to the chase, conceptually speaking, and get to the meat of the matter. However, as soon as a principle is formulated, and one begins to work on applications of that principle, one immediately perceives its inadequacy, and the process of revision begins. We can describe this revision in terms of Hegel or in terms of Popper, as you prefer, though I don’t think Popper would have been pleased by his fungibility vis-à-vis Hegel (1). So I ought now to point out that my above enunciated principle ought to be amended to read, “An x fails when it fails to change as the world changes” (instead of “…when the world changes”). In other words, the kind of change an historical entity must undergo in order to remain historically viable must be in consonance with the change occurring in the world. This is, obviously, or rather would be, a very difficult matter to nail down in quantitative terms. My schema remains highly abstract and general, and thus glides over any number of difficulties vis-à-vis the real world. But the point here is that it is not so much a matter of merely changing in parallel with the changing world, but changing how the world changes, changing in the way that the world changes. 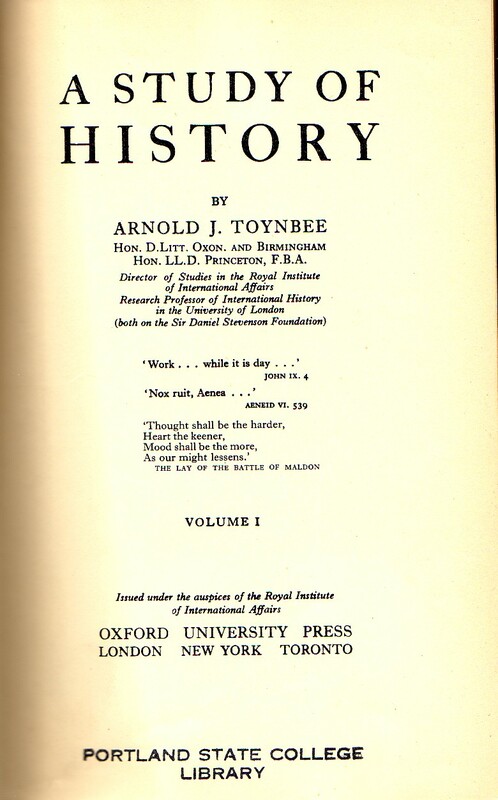 Challenge and response is one of the central themes of Toynbee’s A Study of History. It might also be called the “Goldilocks Principle” (3), as the idea behind it is that a challenge to a civilization shouldn’t be “too hard” or “too soft”. Too much of a challenge can arrest the development of a people, or render them extinct, while too little of a challenge leaves a people soft and without ambition to improve their lot. A challenge that is just right, however, elicits a response from a people that advances their development, perhaps pushing them to develop a civilization if they do not yet have one, or raising their civilization to greater heights if they do have one. I will abbreviate Toynbee’s “challenge and response mechanism” as “CRM” (not to be confused with “customer relationship management”). If this is a valid way of approaching the problem of history, Toynbee’s CRM then becomes a mechanism whereby the PHV functions, so that the former is subsumed under the latter more comprehensive principle. In any case, all of the foregoing is to make the point that Toynbee’s CRM could be profitably applied to historical entities less comprehensive than civilizations, just as with the case of the PHV. If, then, we wished to continue the line of thought I began to develop in More on Republican Disarray, we could observe that a major electoral defeat tied to fundamental demographic changes constitutes a challenge to the Republican Party. Venerable political institutions like the Republican Party and the Democratic Party have all faced challenges. The fact that they are still in existence demonstrates that their responses to past challenges have been effective. But a faltering institution, if faced with a significant challenge, may not possess the strength and vigor to effectively respond to a challenge, and that challenge then becomes not a spur to greater things, but a death knell. Note 1) Popper included a severe criticism of Hegel in his The Open Society and it Enemies. This was later criticized in turn in a devastating (to my mind) paper by Walter Kaufmann titled “The Hegel Myth and its Method” (collected in The Hegel Myths and Legends, edited by Jon Stewart). Note 2) I have discovered through some Google searches that “challenge-response” is also a phrase used in computer systems for authentication, so if the reader is interested in researching this topic online, you will get more meaningful responses if you exclude terms like “spam”, “authentication”, and “password”, etc. Note 3) The term “Goldilocks Principle” is I believe already used in SETI research to indicate the habitable zone around a star. Note 4) Given my recent interest in Toynbee, I checked out from the library Toynbee’s Philosophy of World History and Politics, by Kenneth W. Thompson, and was reading this book this morning (Chapter VI) when the above recorded thoughts occured to me. 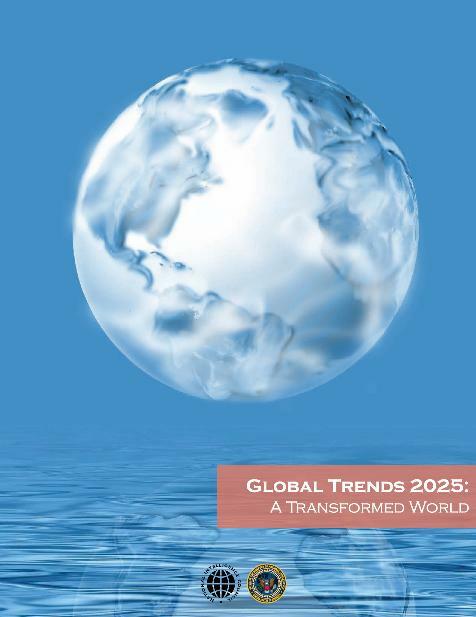 It was my plan to compare Toynbee’s overall predictions for the West, made in the middle of the twentieth century, with the newly released Global Trends 2025: A Transformed World, with its projections, simply as an intellectual exercise. I didn’t get far with this project, but I may return to it. I suspect that Toynbee, for all his faults, will be noticeably superior to this sort of speculation-by-committee.